Join us at The Roxy Theater for Glory! 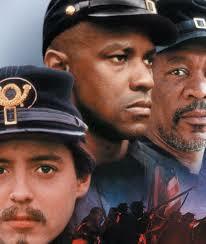 Following the Battle of Antietam, Col. Robert Gould Shaw (Matthew Broderick) is offered command of the United States’ first all-African-American regiment, the 54th Massachusetts Volunteer Infantry. With junior officer Cabot Forbes (Cary Elwes), Shaw puts together a strong and proud unit, including the escaped slave Trip (Denzel Washington) and the wise gravedigger John Rawlins (Morgan Freeman). At first limited to menial manual tasks, the regiment fights to be placed in the heat of battle.